5. any transparent disc of gelatine or glass used to eliminate or reduce the intensity of given frequencies from the light leaving a lamp, entering a camera, etc. A device that transmits part of a received signal and rejects the rest. The signal may be in the form of a beam of light or other radiation or may be an electrical signal. Optical, ultraviolet, and infrared filters are dyed plastic or gelatin, glass or glasslike substances, or confined liquids, all of which absorb incident radiation except for a relatively narrow band of wavelengths. Such filters are used in astronomical photometry, especially in measurements of magnitudes; transmitting bands typically 100 nanometers wide, they are termed broadband filters. Much narrower wavelength bands, of maybe 1 nm, can be obtained with interference and birefringent filters. Electrical filters are devices whose attenuation varies with frequency. Filters that allow low or high frequencies to pass without serious attenuation are called low-pass and high-pass filters, respectively. A filter that allows only a limited range of frequencies through is a band-pass filter while its converse is a band-stop filter. See also bandwidth. in laboratory practice, a device used to separate suspensions into the fluid and solid phases or to determine such filtration parameters as the flow rate, the flow resistance of the filter medium and the filter cake, and the compressibility of the cake. When used to determine filtration parameters, a filter designed for laboratory filtration operates like a filter intended for industrial filtration. A filter used for laboratory filtration consists of a glass vessel, such as a tube or a funnel, that either is sealed near the base by a filter medium made of porous glass or has a perforated bottom covered on top by filter paper, a filter cloth, a filter screen, or some other filter medium. During laboratory filtration, the pressure drop between the two sides of the filter medium is either kept constant or increased at a specific rate. Alekseev, V. N. Kolichestvennyi analiz, 4th ed. Moscow, 1972.
a device that accomplishes by means of a filter medium, or septum, the separation, thickening, or clarification of heterogeneous systems containing a solid phase and a liquid or gaseous phase. The term “filter” is also applied to a number of other devices, which are not discussed in the present article. For example, devices that pass or reject acoustic or electromagnetic waves of certain frequencies are called filters, and the term is sometimes applied to devices that separate polymer ions into fractions or remove salts from solutions by means of ion exchangers. According to the nature of the heterogeneous system, a distinction is made between liquid filters, which are used to filter suspensions, and gas filters, which are used to separate out aerosols and to purify gases. The simplest filter is a vessel that is divided into two parts by a filter medium. A pressure difference is established across the filter to force the liquid or gas through the filter medium, which holds back the solid particles. Liquid filters. Liquid filters are divided according to their method of operation into two groups: filters that operate intermittently, that is, on a batch basis, and filters that operate continuously. Within each group, filters are classified according to the way the pressure difference is created (application of vacuum or pressure), the geometry of the filtering surface (plane or curvilinear), and the type of filter medium used. In an intermittent filter the entire surface of the filter medium is subjected by turns to the following operations: influx of a slurry and formation of a cake (filtration), dewatering, washing and discharge of the cake, and regeneration of the filter medium. In a continuous filter these operations occur simultaneously and independently of one another in an appropriate filter zone. The intermittent group includes filter presses and capacity, leaf, and cartridge filters. Nutsche filters, or by pressure. The housing of the filter may be open or closed. The filter medium is located on a perforated support at the bottom of the filter. The slurry is admitted to the upper part of the filter, and the filtrate is drained from the lower part. 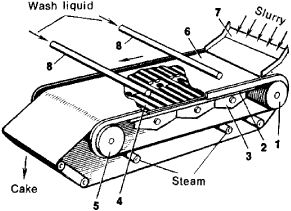 In filters with mechanized discharging the cake is removed through a hinged bottom; in those with an open housing the cake is removed by tilting or by hand. Leaf filters are used to clarify solutions and to separate slurries that contain no more than 5 percent (by volume) of a solid phase. The filter elements, or leaves, are circular or rectangular in shape and are usually covered with a cloth filter medium. Each leaf has an outlet through which the filtrate is discharged. The slurry is fed into the filter tank. The layer of cake is washed after all the slurry has been removed from the tank. Filter presses are used chiefly for fine slurries. They include plate-and-frame presses, chamber presses, and automatic filter presses. A plate-and-frame filter press consists of an assembly of alternating vertical plates and frames. Compression of the assembly is accomplished by a hand screw or a hydraulic or electromechanical closing device. The frames form hollow chambers, into which the slurry is fed when the filter is in operation. The filter medium is laid over each plate, whose faces are ribbed to provide drainage. Under pressure, the filtrate passes through the filter media, runs down the ribbed surface of the plates, and passes through the filtrate outlets to an open launder or a closed channel. The cake formed in the chambers is removed by separating the plates. The chamber filter press operates in a manner similar to that of the plate-and-frame filter press but permits higher pressures. In automatic chamber filter presses the filter plates are located between two supporting plates and are positioned horizontally at a certain distance from one another. The top of each filter plate is covered with a perforated sheet, over which an endless-belt filter medium is located. When the plates are compressed, chambers are formed between them. The slurry, wash liquid, and compressed air (for drying) are successively fed into the chambers from the corresponding channels. The filtrate passes through the filter medium, and the solid phase remains on it in the form of a cake. Upon completion of the filtration cycle, the plates are separated, a gap opens up between them, and the filter medium is set in motion. The cake is carried out from between the plates and is removed with scrapers. The filter operates automatically and is four to ten times more efficient than the plate-and-frame filter press. mounted. Cartridge filters usually have several dozen such cartridges. The cake is discharged by means of an air blast or pneumohydraulic shock or through the use of vibration apparatus. Continuous filters include drum, disk, belt, rotating-pan, and tilting-pan types. Rotary-drum vacuum filters have found the broadest application in industry (seeVACUUM FILTER). Disk-type rotary vacuum filters (Figure 2) are used for slurries having solid particles that are similar in size. Such filters have a more complicated filtering surface than do rotary-drum vacuum filters. A typical disk-type filter consists of vertical disks mounted on a horizontal hollow shaft that is divided into sections. 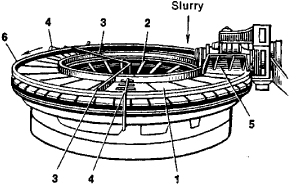 The shaft and disks rotate in a tank shaped like a semicyiinder and filled with the slurry to be separated. Each disk consists of hollow sectors, on which the filter media are stretched. Both sides of each sector are perforated or ribbed. The interior of each sector connects to a drainage channel for removal of the filtrate. For discharge of the cake, a blast of air is applied to inflate the filter bag; scrapers and discharge rolls are used to detach the cake and guide the discharge. Belt vacuum filters (Figure 3) are used for slurries forming a heavy cake that has particles of different sizes and that requires thorough washing. The filter contains suction boxes for removal of the filtrate and wash liquid. The filter medium, usually cloth, is carried by a rubberized perforated belt, which encircles two drums. The cake is discharged when the belt and filter medium move down around the end drum. During the return of the belt the filter medium is cleaned by means of brushes or steam jets. The principal application of the rotating-pan filter (Figure 4) is the dewatering of coarse slurries in, for example, the production of potassium and the preparation of hard coal and ores. The device is a vacuum filter. The filter surface is annular in shape and is divided into trapezoidal segments, each of which constitutes a filter cell. The upper part of each cell is open, and the bottom is inclined toward the center to facilitate the flow of liquid. The cell is covered by a perforated sheet, on which the filter medium is placed. The interior of each segment is connected by pipes to the channels of a distribution system, which is rigidly fastened to the housing. The filter is rotated by an electric motor. 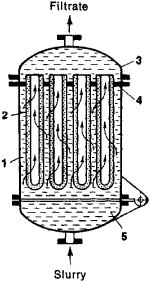 During one rotation a filter cell is successively connected to vacuum and compressed-air lines. The slurry is fed into the cell from above. The cake is removed with a scraper or a screw conveyor. Tilting-pan filters are used for coarse slurries. 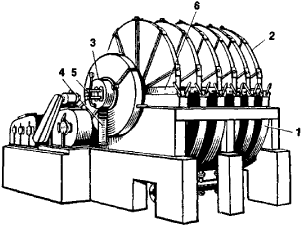 They are operated by vacuum and consist of trapezoidally shaped pans held in an annular frame. The pans are connected by pipes to a distributor, through which the filtrate and wash liquid are removed. The pans revolve as a unit around a vertical axis. Each pan consists of a shell, which, together with the drainage plates and filter medium, constitutes the working element of the filter. The slurry and wash liquid are fed into the pan from above. For discharge of the cake, the pan is automatically rotated by 180° when it is above the discharge site. Gas filters. Gas filters are continuously operating devices. They may be divided according to their structure into two groups: filters having a plane filtering surface and bag, or fabric, filters. The filters of the first group consist of a chamber that is divided by one or two perforated plates. In the case of one plate, the filter medium—which may be, for example, sand or quartz—is placed on the plate. In the case of two plates, a compressed fibrous material—such as asbestos fiber, glass fiber, or glass wool—is clamped between the plates, which are attached to each other. When the gas flows through the filter medium, the particles suspended in the gas are removed. At certain time intervals the filter medium is cleaned or replaced. The filter medium of a bag filter is in the form of cloth or felt bags. The gas flowing into the filter is distributed among the bags. The particles removed from the gas are deposited on the inner surfaces of the bags, and the clean gas leaves the filter through a special outlet. The layer of deposited particles is removed by a bag-shaking mechanism and dumped into the lower part of the filter; then it is removed from the apparatus with a screw conveyor. Cartridge filters are also used as bag filters for cleaning gases. Vettsel’, B. Noveishie konstruktsii fil’trov. Moscow, 1965. Fil’try dlia zhidkostei. Moscow, 1965. Planovskii, A. N., and P. I. Nikolaev. Protsessy i apparaty khimicheskoi i neftekhimicheskoi tekhnologii, 2nd ed., Moscow, 1972. Mashiny i apparaty khimicheskikh proizvodstv, 3rd ed. Edited by I. I. Chemobyl’skii. Moscow, 1975. A device or program that separates data or signals in accordance with specified criteria. Any transmission network used in electrical systems for the selective enhancement of a given class of input signals. Also known as electric filter; electric-wave filter. A porous article or material for separating suspended particulate matter from liquids by passing the liquid through the pores in the filter and sieving out the solids. A device employed to reject sound in a particular range of frequencies while passing sound in another range of frequencies. Also known as acoustic filter. A family of subsets of a set S : it does not include the empty set, the intersection of any two members of the family is also a member, and any subset of S containing a member is also a member. An optical element that partially absorbs incident electromagnetic radiation in the visible, ultraviolet, or infrared spectra, consisting of a pane of glass or other partially transparent material, or of films separated by narrow layers; the absorption may be either selective or nonselective with respect to wavelength. Also known as optical filter. In general, a selective device that transmits a desired range of matter or energy while substantially attenuating all other ranges. 1. A device to separate solids, such as dust, from air. 2. A device to separate solids from liquids. 4. A layer or combination of layers of pervious materials designed and installed in such a manner as to provide drainage, yet prevent the movement of soil particles due to flowing water. i. A device to trap and hold all impurities or solids beyond a specific thickness. The thicknesses of impurities are measured in microns. See fuel filter. See also micron (i). ii. To study all information and discard what is irrelevant. iii. A device for discriminating between currents of different frequencies, selecting some frequency bands and rejecting interference from other frequencies. A band-pass filter has a single transmission band. A high-pass filter passes currents with frequencies higher than a nominal cut-off frequency, and it highly attenuates those with frequencies below. A low-pass filter works in the opposite manner. See also bandpass. (Originally Unix, now also MS-DOS) A program that processes an input data stream into an output data stream in some well-defined way, and does no I/O to anywhere else except possibly on error conditions; one designed to be used as a stage in a pipeline (see plumbing). Compare sponge. (1) To select data. Filters use patterns (masks) against which all data are compared and only matching data are "passed through," hence the concept of a filter. For example, email clients and servers can look for messages with text patterns that are recognized as spam and delete them. An email client can be set up to filter messages and store them in separate mailboxes as a way of organizing the mail, or it can be set to alert the user when a certain type of message arrives. See Bayesian filtering and spam filter. (2) To change data. In this usage of the term, the concept of a filter (a pass-through device) is less obvious, but nevertheless widely used. For example, a sort routine changes the sequence of data. A conversion routine (import or export filter) changes one type of data, text or graphics format into another. See image filter and parse.